A century of Eagle Scouts: Scouting leaders have trong legacy in Historic District - The Resident Community News Group, Inc. | The Resident Community News Group, Inc.
Eagle Scout Riley Sapora was standing on a mountain summit in Costa Rica with a group of fellow students when suddenly one member fell over a ledge, slipping 10 feet into a crevice where his leg got stuck. He climbed down and the others, following his lead, lifted the injured man to safety and began a grueling seven-hour journey down the mountain. Sapora, 23, who earned his Eagle five years ago, has no doubt that his training to achieve the highest award in Boy Scouting is the reason he responded without hesitation. “It prepares you to handle any situation,” said Sapora, from Troop 2, St. John’s Presbyterian Church in Riverside. Coincidentally, the injured student was also an Eagle Scout. That bond began 100 years ago on August 1, 1912 when the first badge was awarded. Eagles throughout Jacksonville’s historic district often share with family members. In Sapora’s case, two brothers: Joey, 20, and Ben, 18. The Sapora brothers said that there was no real competition between them. “It actually made it a lot easier that my brothers were helping,” Ben Sapora said. 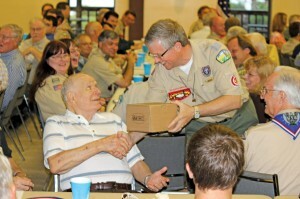 He credits not only his brothers, but also his scoutmaster, Alan Wilson, for his achievement. Wilson became Troop 2 scoutmaster in 2005 and has helped 34 scouts earn their Eagle. For him it is a family tradition going back three generations beginning with his father. Alan Wilson proudly states that his son is a better scout than he ever was. Most Eagles cite the Service Project as being one of the strongest character and leadership building experiences. The project and a minimum of 21 merit badges must be completed prior to the scout’s 18th birthday. The scout must independently plan and execute a project that benefits an organization other than the Boy Scouts. Kent Zeigler repaired a roof at Iglesia Presbyterian Church. The project took 120 hours and extensive coordination with the church’s pastor, building professionals and fellow scouts. “It was really hard but really rewarding and I learned a lot,” Kent Zeigler said. The project measures the scout’s ability to take ownership and see a large task through to its end, said Mark Zeigler, who co-chairs the Eagle Advisory Board. Equally powerful and emotional is the Eagle Court of Honor and badge presentation. Sometimes the guest speaker distinguishes the ceremony. 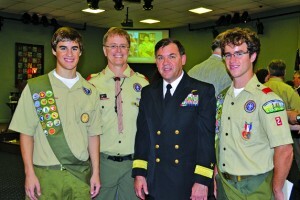 Ben Wilson, Ben Sapora and four fellow scouts had the unique honor of receiving their badges in the presence of Rear Admiral William Sizemore, Chief of Naval Air Training. He also happens to be a Troop 2 Eagle Scout. Other times, it is a display of the very character traits for which they are being honored that marks the ceremony. That was the case on August 12 when Ortega residents, Stephen and Christopher Barton from Troop 26, St. Mark’s Episcopal Church, received their badges. Stephen, 20, waited nearly three years while Christopher, 18, earned his badge so that the two could receive them together. These are sentiments to which Riley Sapora would relate. That rite of passage seems to lead to success: Riley Sapora is a recent pre-med graduate, Ben Sapora a business major, Ben Riley a computer science major and Stephen Barton studies creative writing while Christopher Barton majors in criminology.